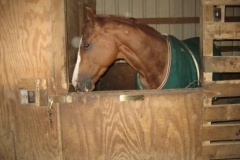 Carmac was a Prospect Horse on the Bits & Bytes Farm Web site in September 2008. He was purchased by Morgan Shaw of Brooksville, MS. He is being trained and ridden by Bill Hoos.